These woodworking toy plans are for inspiring your child's imagination. They can speed along with their own town car or roadster and have hours of fun. The rocking horse can provide hours of fun and become an heirloom. They can hand it down to their own kids. Wood toy plans are so easy to follow that you can make them in just hours. Just imagine the fun you will have making them for your child. 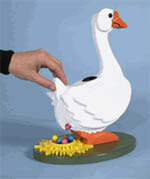 What kid wouldn't want a golden egg (gum ball) when this 13"-tall goose lays a tasty treat at the flick of its tail? Full-size patterns make cutting the pieces for this project a breeze to cut in an evening. 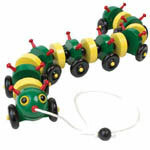 This funny friend wiggles over bumps and around corners to the delight of children and parents. Clippity-clop, clippity-clopâ€”thatâ€™s the sound our galloping horse makes every time you set it a-rocking. Place the maned toy rocker on your childâ€™s dresser, or give it to a deserving friend. Either way, youâ€™ll ride high in the saddle with the joy you bring. Toddler Town Car Small children just love the rattling sound of the table-tennis balls inside the wheels of this foot-powered vehicle! Perfect for developing young muscles, our stable little car should lead the parade in any playroom. Sidewalk Speedster The old Irish Mail zooms back with a new look. Back in the 1960s (and even before then), youngsters whizzed along sidewalks on hand-powered speedsters called Irish Mails. Here's an updated version of the classic rider you can build for some lucky boy or girl. Playroom Palomino Rocking Horse A Family Heirloom the Moment You Finish It Little buckaroos will ride into the night, or at least until bedtime, on this soon-to-be classic. Its stylish lines and straightforward construction make for a sure winner. 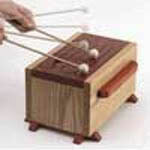 Tone-of-fun tongue drum Make beautiful sounds by striking the slitted top of this six-note, easy-to-build instrument.